Christmas in Nashville is a magical journey through nostalgia, make-believe, and joy. With dazzling lights, holiday happenings, musical performances, and historic homes decked out in holiday finery, Music City goes all out to celebrate the season. Throughout Nashville and neighboring communities, festive lighting decorating neighborhood homes and spectacular light displays lighting up large venues transform the ordinary into Christmas wonderlands. With a flip of a switch at 5:45 pm every evening between mid-November through January 1, Christmas magic lights up Opryland’s Magnolia Lawn in sparkling beauty. Over 2 million lights herald in traditional sights and sounds of Christmas, and custom designs add a unique Music City vibe. Nightly until January 1; drive through Jellystone Park to the surround-sound dancing light show. Thousands of synchronized Christmas lights twinkle to the beat of Christmas tunes coming through the car radio. 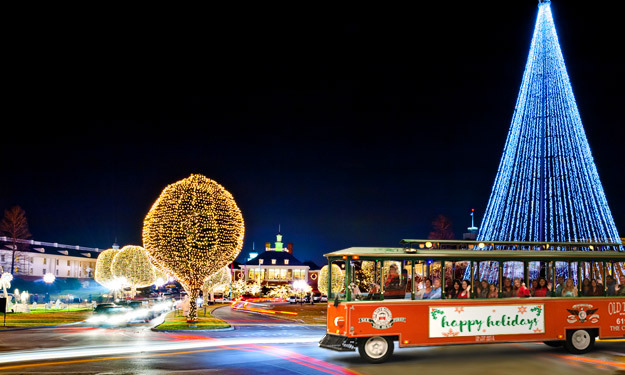 Animated displays, including a spectacular 35-foot high Christmas tree and a Santa Village, add to a favorite Nashville tradition. In December, one million lights beautifully placed throughout Cheekwood Gardens, Nashville’s spectacular botanic garden, cast an unforgettable glow. Bundle up for a gorgeous 1-mile winter stroll through elegant displays on a multi-sensory journey through dazzling lights and views. Throughout the grounds, live reindeer, carolers and S’more pits create an evening to remember. Thanksgiving Day through Christmas, drive south to Old Charlotte Pike in the community of Franklin and along Sparrow Street in nearby Spring Hill to see magical light displays dancing to synchronized music. From Thanksgiving Day to New Year, homes in Brentwood on Sunnyside Drive go all out by putting on a show every holiday evening. Park and walk for a special neighborly experience of Christmas lights and favorite holiday figures. Santa takes a break from his Christmas preparations to make an appearance every evening during Christmas week. Every Thursday, Friday and Saturday in December, tour through several acres filled with hundreds of thousands of animated lights, beautiful lighted scenes and displays at the James E. Ward Agricultural Center in Lebanon, 35 minutes east of Nashville. Kids love the Grinch in Fiddler Cove Jail, the Nativity scene, and a post office box to drop off their Santa letters. The drive through Fiddlers Grove, where over 40 village houses are lit up for Christmas, is a special step back in time to Christmas past. Cruise along the Cumberland River enjoying a seated dinner and an evening of festive holiday-themed musical entertainment aboard the General Jackson, a large, grand paddlewheel riverboat. From mid-November through Christmas, the popular General Jackson Dinner Cruise is replaced by the Holiday Dinner Cruise & Show. Dining, dancing, fabulous views of Nashville’s skyline glowing in holiday lights, and lively holiday entertainment performed by some of Music City’s finest country musicians and singers will get you in the holiday spirit the Nashville way. From Thanksgiving to January 1, enter the world of an elegant Victorian-era Christmas at the Belmont Mansion. Fully decked out in hundreds of gorgeous Victorian decorations, garland swags hanging from door frames and lavish flowers lining mantels, it’s a beautiful, timeless experience. By day, enjoy the holidays at The Hermitage, the mansion of President Andrew Jackson and his family. Special Christmas exhibits feature early traditions and decorations of the 1800s. Enjoy delicious meals in the cafe and unique holiday shopping in the museum store. During early December, the home is open at 7 pm for Hermitage Holiday Evening Tours, a rare trip back to Christmas traditions of the Jackson family in the 1800s. Guests visiting Nashville Zoo during the weekends of December, step back in time for a traditional Victorian Christmas in the historic Grassmere Home. Decorated in holiday greenery, ribbon and vintage decorations of the Craft family who owned the home for five generations, it’s a great way to see Christmas through time. Tours offered from 10 am-3 pm highlight the decorations and explain Christmas traditions of that period. Christmas music and caroling will also fill the grounds at various times. Experience how Christmas was celebrated in the 1830s in a simpler home. Costumed docents explain details of the holiday guests the Overton family entertained and the traditional ways they were entertained. From November 1 until December 31, the rooms of Belle Meade Mansion are filled with 10 Christmas trees and decorations, each representing a different decade in history. 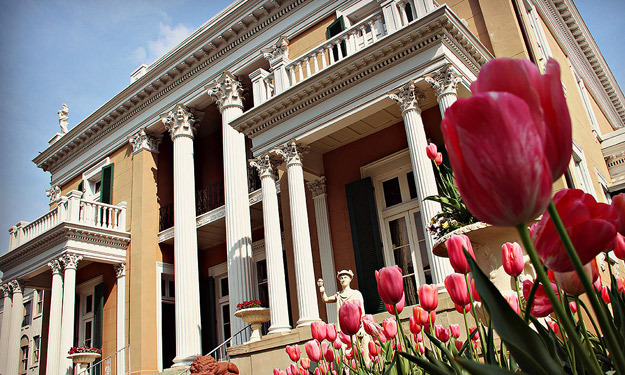 On the guided tour around each tree, the traditions of those who called Belle Meade Mansion home from the Antebellum period through the mid-twentieth century unfolds.